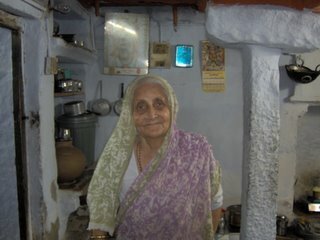 Chanda Vyas, an old lady aged above 60 years, runs Vyas Meal Service single handedly in the interiors of Jaisalmer Fort. Her modest restaurant runs solely on the integrity of the guests as Chanda cannot read and write and cannot prepare a bill for her guests. But, she cooks with true love and devotion and it reflects in her divinely delicious food and special ‘masala’ tea that has a distinct aroma of freshly ground spices. After the death of her husband, Chanda is still fighting, all alone, against the rigor of life. Her son has abandoned her but she is still holding on to the meal service, which was her initiation. Had it been someone else, she would have given it up a long time back and become a burden on the society. Rather, her one-woman army meal service gives employment (both direct and indirect) to a few. She can manage to understand the needs of her guests and provides such great food that she finds a mention in the highly regarded Lonely Planet ‘India’ guide book. One look at her drooping back evokes pity that she needs to work so hard at such an age for a living, but once you know her enterprising spirit and her self-confidence you are completely awe inspired. She does it not for money but for the joy of serving people with food and spending her time. At dinner time, the restaurant is usually full of guest having varied needs, which in any way is Herculean task, but for a woman of her caliber it is merely an everyday chore. People return to their work with their tummy full, satiated soul, a pair of loving eyes to remember and an immense lesson of courage.